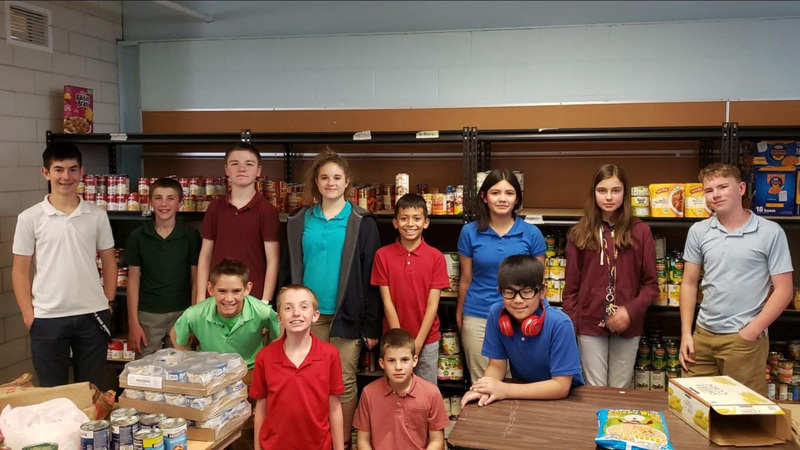 Middle School students at Mile High Academy are helping those in need through food drives for Meals on Wheels. According to Meals on Wheels, one in six seniors face the threat of hunger and many more live in isolation. Meals on Wheels offers people from city and county governments, non-profit organizations as well as agencies that work with seniors opportunities to learn more about their program with a tour of their facility. Our students toured the Littleton Meals on Wheels facility and came away blessed by those who work there and aware of the huge need in our community. Since January, students have been asking the school community, churches, neighbors, family, and friends to participate in this project. So far, students have collected enough to fill 4 of the 70-quart utility bins of non-perishable items to donate to the Meals on Wheels pantry. Seventh grader, Jonas says that he wasn’t aware of the great before taking this Real World Learning class and that’s why he is glad he's in it. It also makes him feel like he’s doing his part. Mr. Jerson Malaguit teaches the RWL class as part of the service value at MHA. Students learn about their community and how to make a real difference.